ETALIAN FOOD ship to any country in the world for all shipments to the countries outside the EU the recipient has to pay VAT and customs duty in force in his own country. We remind our customers that the delivery time can be influenced by various external factors beyond our control, such as adverse weather conditions, strikes, customs control, etc..
*Etalianfood is glade to offer you 12 Euros OFF on Shipping Cost. Promotion applicable to orders over 99 euro (subtotal excluding VAT), the calculation is carried out automatically at check-out, copy and paste this code at the checkout: SHIPDISCOUNT to receive the shipping discount (12 euros). Sign up to receive Our Welcome Discount Code! All deliveries are made by express courier and the costs, which are based on the weight and the country of destination, are shown during the purchase procedures. The delivery costs do not include potential import / export taxes that need to be paid by the client. Please bear in mind that when you place your order online, the system automatically calculates the delivery price including also the weight of the packaging, these are visible in the cart after you add at least one item. One more thing, to use the delivery costs efficiently, we advise you to not buy too little. The delivery costs depend upon weight! Listed below are Our delivery details, the service level offered, for the prices charged, for further details contact us at info@etalianfood.com or use the estimate shipping at the checkout. Shipment Bands: kilos 0-2; 2-5; 5-7; 7-10; 10-15; ecc.. Upon receipt of the delivery of the items acquired the clients has to verify the following: The number of the items delivered needs to be the same of the number written on the transportation form. The delivery package has to be intact and well preserved. In case the number of items delivered is not the same of the number written on the transportation form and/or in case of damages caused by the delivery the client has to immediately notify the express courier clearly specifying the reason. Once the client has signed the transportation form without notifying the delivery company for any damage or problem in relation to the package received, the client has no more the right to ask for any refund in relation to the package received. Please note that once the package is delivered and accepted by the client any potential insurance coverage automatically decays. b. The delivery package has to be intact and well preserved. In case the number of items delivered is not the same of the number written on the transportation form and/or in case of damages caused by the delivery the client has to immediately notify the express courier clearly specifying the reason. Once the client has signed the transportation form without notifying the delivery company for any damage or problem in relation to the package received, the client has no more the right to ask for any reimbursement in relation to the package received. Any potential problem related to the packages received needs to be notified within 7 days following the procedures specified in this document. In case the express courier is not able to deliver the items to the client, the express courier will held the items for 5 working days in its warehouse. After 5 working days the items will be sent to etalian food warehouse in Florence – Italy. To receive the delivery the client will need to pay again the delivery cost. For any questions or need on shipping, please send an e-mail info@etalianfood.com. 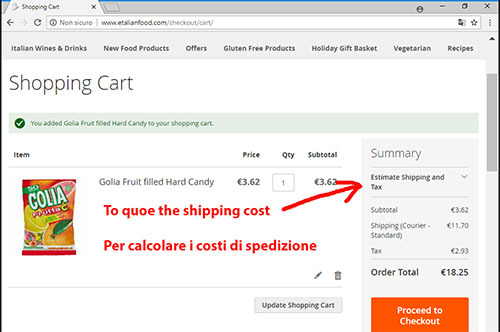 On etalianfood.com website are supported all the most popular types of payment, afte the purchase you will be redirected within Banca Sella or Paypal. Pay pal immediately after the payment, the total amount of the purchase will be charged to the client. On Paypal you can use your paypal account or all credit cards. MyBank is an e-authorisation solution which enables safe digital payments and identity authentication through a consumer’s own online banking portal or mobile application. ETALIAN FOOD as the right to ask the client any additional information considered relevant to identify the owner of the bank account, credit card or paypal account used for the payment. Etalian food has the right to cancel the order in case the client decides not to provide etalian food the additional information required. ETALIAN FOOD cannot be considered responsible for any fraudulent use of the credit card details of the client used to purchase items www.etalianfood.com , www.etalianfood.it , www.etalianfood.co.uk .